Rob Paull bikepacking in Cathedral Valley. Depending on where one looks for advice, a good cycling companion has the following traits; a good cyclist, a positive attitude, helpful in a number of ways, sociable yet capable of being alone, entertaining, able to repair a bike, comfortable with camping, humorous and resourceful. I had the pleasure of riding from Yellowstone NP with Rob Paull over 5 days in 2014. He has all of the listed traits plus as an added bonus he is a senior citizen like myself. Cycling Utah: Rob, You caught the bicycle travel bug shortly before I did. Tell me about your experience as a bike traveller. 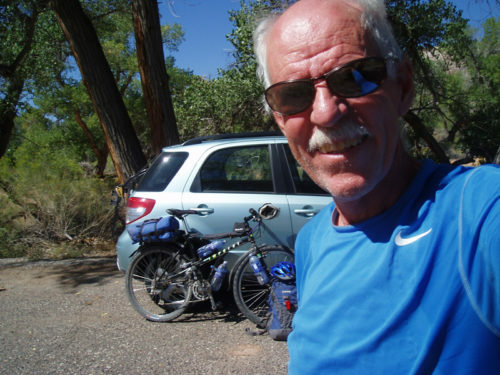 Rob Paull: I did my first tour in 1974 in Michigan, it was a supported 4 day tour from Lansing to Mackinaw City, called DALMAC put on by the Tri-County Bicycle Association. I guess I got hooked as I did 27 more of those tours over the years, 10 of them with my son. Got so I knew every good restaurant and bar between Lansing and Mackinaw. It was always a fun ride. On a number of those trips through Michigan I returned home on my bike as well. I've also had the opportunity to do some longer tours as well including a couple of cross country’s as well as a trip up to Alaska and a West Coast trip. Since moving to Utah I've done several Southern Utah Parks tours and a number of self supported tours organized by the Wasatch Mountain Club most of which were a week or so long. I’ve also ridden a number of solo trips around the Southwest of varying time and length during my time in Utah. C.U. 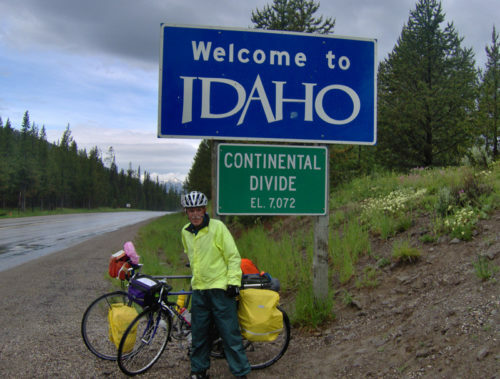 : If a young couple, (anyone under 55 in your case), wanted to do a 2-3 week bike tour say to Yellowstone National Park and back, how would you counsel them? R.P. : I would say to someone considering this trip or any trip is to just do it. You might want to talk to someone who has done it before or read some trip reports by others who have done this trip, go to one of your (Lou Melini’s) touring talks at REI, etc. Give yourself plenty of time so you’re not going to be pressured to be back at an unrealistic date. Another good thing to try is to load up your bike with everything you think you'll take on the trip and do an overnight to a campground near your home of 30- 40 miles. That way if you find you've forgotten anything it's no big deal and you will not forget on the longer trip. Also more importantly you might find things you took that you really don't need and can leave at home. But still the most important thing to do is JUST GO!!! You will quickly learn. C.U. : When we traveled home from Yellowstone, I was impressed by your simplicity, yet completeness of gear. What do you look for in tents, stoves, sleeping bags, tools, spare parts, etc.? Top of Targhee Pass in the rain during a tour of Yellowstone in 2014. Photo by Rob Jones. R.P. : Over the years, as I've gotten older and the miles have gone by, I've looked at my gear and have learned what, for me, is important to carry along on a trip. I've tried to lighten my load as much as possible and now carry about 20lbs. or less, not counting food or water. I use the lightweight backpacking ideas as much as possible. The tent I use most of the time is a one-person single wall self-standing model that I've found works well for me in the Southwest climate. Most of the time I use a small canister stove or a homemade alcohol one. As for sleeping I use one of the inflatable insulated mattress that are available and in the summer a 40 degree down bag. To me getting a good night sleep is one of the most important things to achieve in order to have a successful tour. For tools and spares, I only carry on the bike those tools that I need to work on the bike I'm touring on; I only take the Allen wrenches that fit the bolts on the bike. Four Allen's are lighter that a whole tool set of Allen's most of which don't fit anything on the bike. Also I carry a small chain tool and lightweight wrenches to fit bike. I carry a small container with a few various size bolts and nuts, a master link for the chain also spare brake and shift cable. I guess I would advise looking at all your gear, and seeing where you can eliminate stuff and still be safe and comfortable, it's sometimes hard to do, as there always seems to be a new gadget available that seems indispensable, and probably is. C.U. : What are your clothing choices for either on or off the bike? R.P. : Ah, clothing choices. This is one area where a lot of bulk can be eliminated from your bags. Of course what you carry will depend on when you tour and where you go. This is what I find comfortable to wear on the bike while touring. I use padded bike underwear with light nylon zip off leg pants with leg clips, a long sleeve light colored seersucker cotton shirt, wool socks and light hiking shoes or sandals, (I use flat BMX type peddles on my touring bike), helmet and cycling gloves. In my bags I carry an extra pair of bike underwear, wool socks, cotton underwear, nylon running shorts and shirt, light pile shirt, light rain pants and bike jacket, and a down vest in a stuff sack. C.U. : One can find a number of opinions regarding bike choices for traveling. What are your suggestions? R.P. : Bike choices are another personal thing. Everybody has ideas on what one needs for touring. My advice is don't let not having a “touring bike” prevent you from touring if you want to!! You can tour on any bike as long as it fits you and is mechanically sound. I've toured on a number of different bikes over the years from a '72 Viscount 10 speed with a flimsy rack to modified mountain bikes to true touring bikes. I currently have several mid 1980's steel touring bikes that I have purchased and restored to make very nice touring bikes once again. These bikes are out there and if you have the skills to bring them back to good condition they make wonderful touring machines. A number of bicycle manufacturing companies made very nice touring bikes in the mid 1980's just before the introduction of mountain bikes. My current favorite ride is a 1985 Trek 620 which is a true touring bike with long chain stays and relaxed frame geometry. It has a 6 speed rear cluster which some don't think is enough gears, but I have found that it's not how many gears a bike has but how the ratios are set up, and how low a gear ratio you can get on your bike. I like steel and I like simple. C.U. : What are some key mechanical skills one should have for bike travel? What problem solving tricks have you had to employ on the road? R.P. : You have to know how to repair a flat first and foremost. It's also good to know how to adjust your brakes and shifting mechanism. Learn how to break a chain and what you need to splice it together again. Field replacement of a spoke and truing a wheel are also good skills to have. If you do rebuild a bike yourself you will learn most of these skills plus you will know how all the parts of your bike go together. REI offers bike repair classes or volunteering at the Salt Lake Bicycle Collective will give one a wealth of skills. I've broken a couple of rear shift cables over the years without having a spare. One time I jammed a tapered stick I made into the parallelogram of the derailleur to hold the chain in a comfortable gear to get to the next town with a bike shop, another time I just tied a knot in the cable by the rear cable hanger to keep in a chosen gear. I've also broken chains and spokes and had to repair them in the field. C.U. : One issue bike travellers face is the decision to travel solo, with one other person or with a group. Do you have a preference? 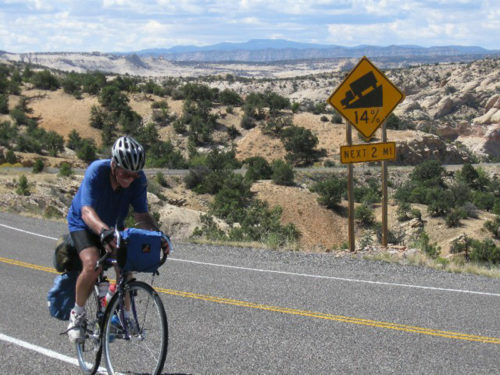 Near top of climb out of Calf Creek in Southern Utah. Photo by Rob Jones. R.P. : I have done most of my tours solo and I do enjoy going that route. I like the total freedom solo touring provides. I can go as far as I feel like, stop whenever it suits me, eat when it seems right, and stay in or out as I choose. If I decide to change my route plans I can just do it, no problem. I find I interact with the people I meet along the way more when I tour by myself and I enjoy that, as most everyone I've met has been pleasant and interesting. Of course the down side of solo touring is you have no one to share the joys and hardships of the trip with, no one to help if you have a break down, no one to go for help if you need it. The things that I brought up as a negative point in solo touring is a plus when touring with a partner. And the positive points of solo touring become negative when touring with another. You have to always work out how far to go, when to eat, and so on. Choosing ones partner for touring then becomes quite important as you must be able to get along and be compatible which each other or it could make for a very unpleasant trip for both of you. Of course one of the big plusses with a partner is a reduction in camping fees, food costs, and the equipment load can be shared. When I went to Alaska it was with a partner and a good trip. Group touring is like touring with a partner only requires much more planning as places to stay have to be planned to accommodate a group, no camping in the ditch. Compatibility issues will be more pronounced, and the probability of mechanical problems will increase. But if all the problems are handled well, group touring is a whole lot of fun, and a great way to go. You asked what type of touring I like and I guess my answer is I like them all. The main point is to just GO!!!! Last year when we did the tour up to Yellowstone and back, I had the opportunity to do all three types of touring. The first five days I went solo from SLC area to Coulter Bay in Teton Nat. Park where I hooked up with the rest of the group and toured the next five days with them, and had a great time. And of course the last five days I had a very pleasant trip back to SLC with you, Lou. On that trip I enjoyed every phase as I enjoyed my road time alone, then road with a great group of people on a well organized tour through the parks, then had a great trip home with you, as we had a lot of fun and I thought were very compatible partners. All in all a great trip! C.U. : Do you have any favorite 1-3 week tours one could do in Utah? R.P. : One of the tours I enjoy is of course the Teton – Yellowstone trip we did last year. That was the third time I've done it. Also I like the loop trip starting and ending in Cedar City, going down to Zion N.P. to Bryce Canyon up to Cedar Brakes and back to Cedar City. A nice weekend mountain bike overnight bikepacking trip, I've done twice, is the Cathedral Valley Loop in Capitol Reef N.P. A couple of nice road overnighters I've done are to ride from Salt Lake or take FrontRunner to somewhere convenient and ride to Antelope Island. Also take Front Runner to Provo ride to and up Hobble Creek Canyon to the campground at the end of the paved road. A few years ago I went on a Wasatch Mountain Club trip to do a loop from Green River to Hanksville to Natural Bridges to Blanding, Moab, and back to Green River. I had to drop out due to a medical condition and want to finish that trip. I'm planning on going in early May, so that should be fun. Utah has some of the best biking country in the U.S. just open a map and pick a route and just GO!!! !